Well, to one, at least. In March 2007, the crown corporation which legally exists as Newfoundland and Labrador Housing Corporation, dutifully started referring to itself as "Newfoundland Labrador Housing (Housing)" for some mysterious reason. In April 2011, it just as abruptly stopped doing so. To be sure, an election is a finicky exercise, and observers are typically loath to predict the outcome. Still, conservative parties in Saskatchewan, Manitoba, Ontario, Newfoundland and Labrador and the Yukon appear poised to retain power or at least pose a serious threat to long-time Liberal or NDP governments. Can K.B.C., or anyone else, point out anything about the Progressive Conservative Party Dunderdale2011 of Newfoundland and Labrador that can, however, remotely, be classed as "right", or "conservative" with a small "c"? The stall-and-pivot manoeuvre, and increased calving activity, are both likely explained by an intimate encounter with Tooker Bank, off the southern entrance to the Strait of Belle Isle, where there are least depths of as little as 14 fathoms. Even the outer slopes of Tooker Bank would easily be shallow enough for the several hundred feet depth of Petermann ice to catch on. It slowed a little, making just 19 km in 24 hours, and its path curled back to seaward slightly. 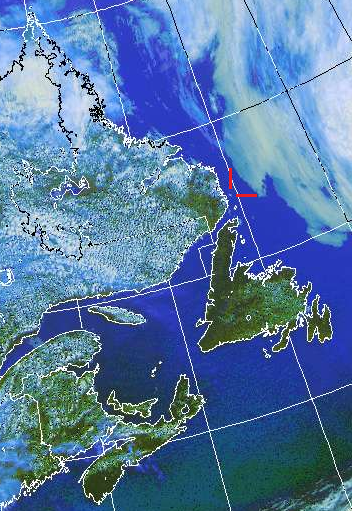 At the time of this image, it was about 36 km northeast of Quirpon Island on the northeast tip of Newfoundland's Northern Peninsula. Quirpon, lost in the fog, is due south of the barely-visible Belle Isle. 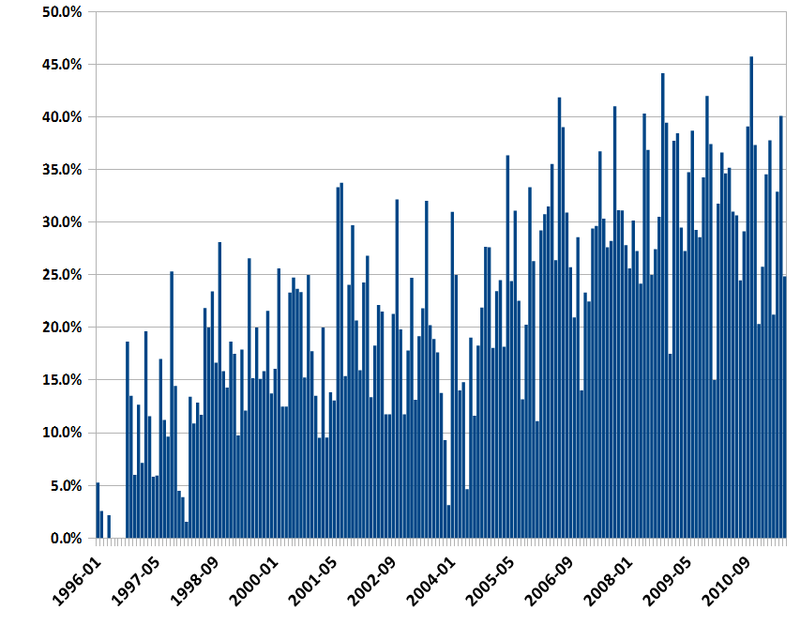 "Media Advisories" or "Notes to Editor", as a percentage of all provincial government departmental news releases, by month, 1996-present. From the same image that was the source of Thursday's Petermann update, comes this selection, showing a swath of central Labrador in the Lake Melville and Sandwich Bay regions. 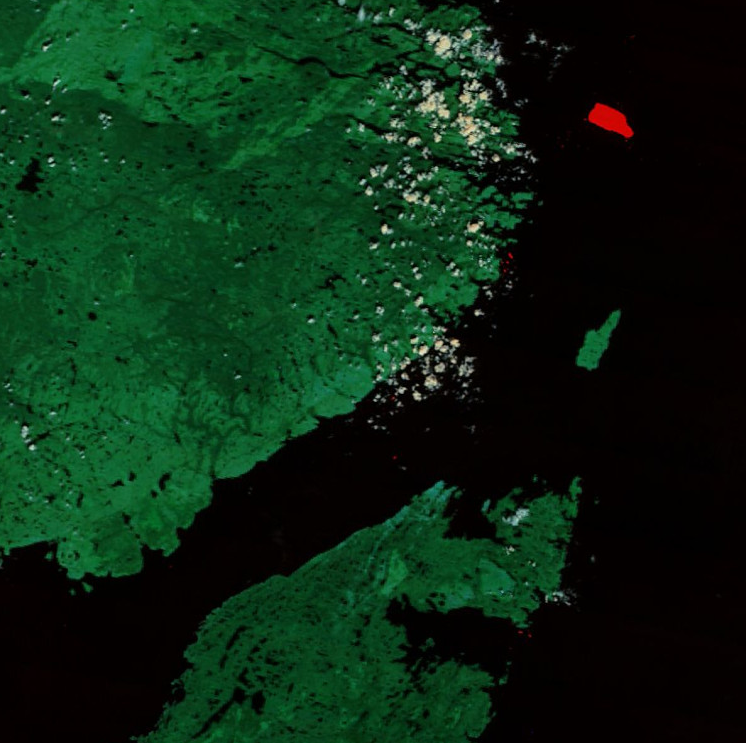 The built-up area of Happy Valley-Goose Bay is visible as a blue-green splotch. To the north, as far as Nipishish in the extreme top left, and east to the head of Double Mer, old burned areas show up as paler shades of green. Other large forest fire scares are noticeable southwest of Sandwich Bay, along the Paradise and Eagle Rivers. 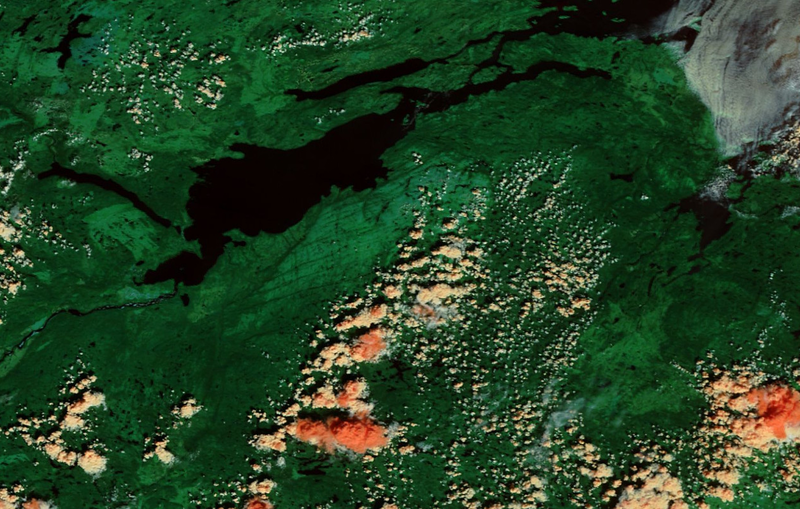 In the centre, the barren Mealy Mountain tops are quite prominent, and to the west, the l0w-lying Maishes which cover the ground from the shores of Lake Melville east to the foot of the hills. Puffy cumulus clouds show up as bright orange in this false-colour scheme, while white coastal fog dominates the outer reaches of Sandwich and Groswater Bays. About 2 1/2 miles S. by W. from the east point of Wreck Bay lies a small patch of rocky ground with 5 fathoms least water. The bottom can be plainly seen on this patch in fine weather; there is a heavy swell upon it in easterly gales, and frequently a great rippling: icebergs often ground upon it. Petermann made about 22 km in 24 hours, slowing down slightly from yesterday's break-neck speed of over 1 km/h, and — interestingly — curling back in slightly towards the coast. Who knows — the northeastern tip of the Northern Peninsula from Quirpon to St. Anthony could be in for a show as the ice slips into Newfoundland waters overnight and into tomorrow. Calvin Poole of St. Lewis captured this video on Monday from out on the water just a few miles off the Labrador coast. 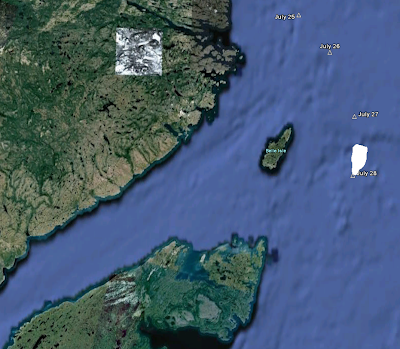 It would appear to be the first published video of the main Petermann Ice Island from on the surface of the ocean. (Vik Adophia's CBC footage was from the air). Also, it would take just an hour or two to wade back through the last four years of government news releases, to see if there are similar orgies of announcements at this – or any – time of the year. If spending until recently has been tight, that might indicate that government has been salting away these little gifts for months and possibly years (which, in turn, could raise questions about the propriety of holding back life saving equipment for reasons of political opportunism). The chart is cleverly colour-coded to reflect the change in government during the time period under consideration, and within the PC era, the dark blue columns represent the June-July time frame in the pre-writ period of election years (E), as contrasted with non-election (non-E) years. - Mere media advisories, or advisories to the public on health, safety, or government operational matters, have been excluded from the count. - Also excluded are Environmental Assessment Bulletins, joint releases (Council of Atlantic Premiers, Council of the Federation, Council of Eastern Premiers and New England Governors, etc. ), and all press releases circulated by a provincial communications shop on behalf of another agency (it used to be common for the province to circulate releases on behalf of Marine Atlantic. - Releases by officers of the legislature (such as the Chief Electoral Officer, Auditor General, or Privacy Commissioner), or of arms-length bodies (Petroleum Products Pricing Commission, High School Sports Federation, etc.) are also excluded. - Joint funding or policy releases with a federal government department or minister are, however, included. This leaves press releases which are both substantial in nature, and regarding which there may have been local political considerations which influenced both the announcement and its timing. 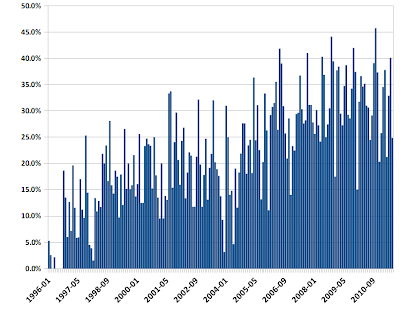 There is a significant upward swing in announciness in recent years. This may not be particular to the June-July period, as the provincial government has just plain been cranking out more stuff all year long. However, the two spikes in 2007 and 2011 are quite noticeable. And in the post-1995 internet era in provincial government communications, there has never been a four weeks even remotely like the past four weeks for Super Happy Fun And Often Money-Related Provincial Government Announcements Which Are Totally Unconnected To The Election That Premier Dunderdale Is Going To Call On September 19th (Nothing Could Be Further From The Truth). At around mid-day on Wednesday, the Petermann Ice Island was abreast Belle Isle, having made about 25 km in 24 hours — quite speedy by its recent standards. This Terra image from NASA is reprojected into a perspective view using Google Earth. 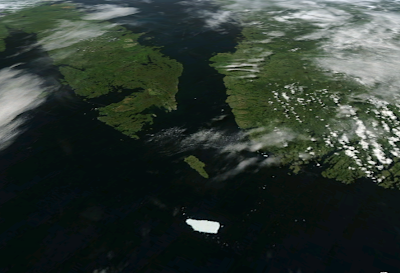 Other large bergs are visible in adjacent waters, in the Strait of Belle Isle, and in Hare Bay. 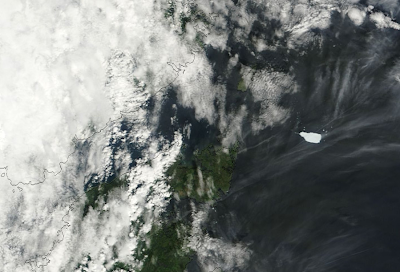 OK, it's one thing when automated satellites capture the Petermann Ice Island in their imaging, amazing as it might be. It's quite another when a human being, orbiting the earth in a tube in the sky, does the same thing. American astronaut Ron Garan, aboard the International Space Station, shot this picture yesterday from 387 kilometres above the surface of the earth. The Labrador coast from Denbigh Island to St. Lewis, along with several seasonally-occupied harbours, is visible on the left. The community of St. Lewis can be identified by the local airstrip, a straight linear feature visible between the harbour and Fox Harbour Pond, the largish lake in the middle of the peninsula. Col. Garan's photo clearly shows the numerous meltwater lakes which dot the ice island's surface, as well as numerous smaller icebergs which have calved off the main body of ice. 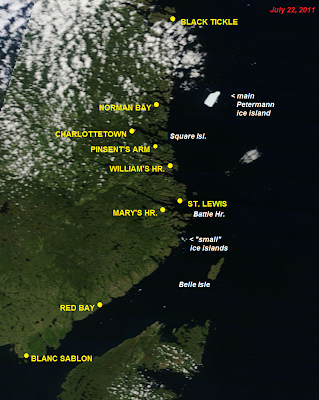 Several of these "small" icebergs are themselves large enough to be classified as ice islands, and would easily clog the entrance to St. Lewis or other harbours along the coast if they drifted inshore. Jason Major at Universe Today put together a stunning graphic which shows an outline map of Manhattan at the same scale. The Pubic Utilities Board announced Tuesday that it has hired Manitoba Hydro International (MHI) to help review the Muskrat Falls hydro project. The government has ordered the PUB to review Muskrat against an isolated-island option, to determine which will be the lower cost for electricity consumers. In a news release, the PUB said that it has been getting documents from Nalcor since mid-June and MHI will be reviewing all of that data and analysis. All documents will be posted at www.pub.nl.ca, and MHI will author a report based on the documents. The PUB is also planning on posting public hearings starting in October; specific dates have not been determined yet. What are the chances that the specific dates, purely coincidentally, will begin on or after October 12th? Azzo Rezori’s piece included a map, showing all 19 communities that received fire trucks in the last 90 days. I would like to see this information overlaid on a map of the province’s electoral districts, to see how the pork is being distributed. It’s all conjecture, but it’s fun to look at the data. Starting in 2009, and in each year since, the Department of Transportation and Works no longer puts dollar figures in its district-by-district highway press releases. 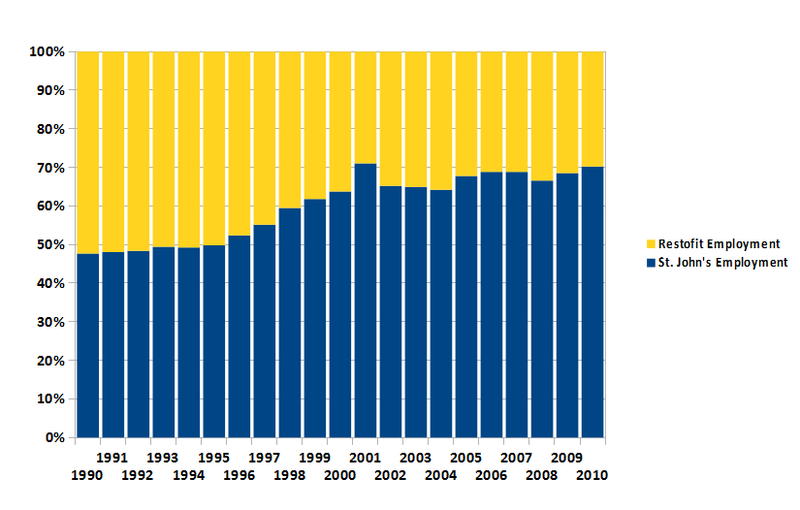 The Williams Provincial Dunderdale2011 Government is the most open and transparent government in the solar system. Better yet: the Terra satellite's false-colour band 3-6-7 imagery is just the ticket! Click to enlarge; one pixel one the image represents about 250 metres. Terra's 3-6-7 imagery combines visual and infrared wavelengths to help tease out details in earth imaging that aren't visible in normal light alone. 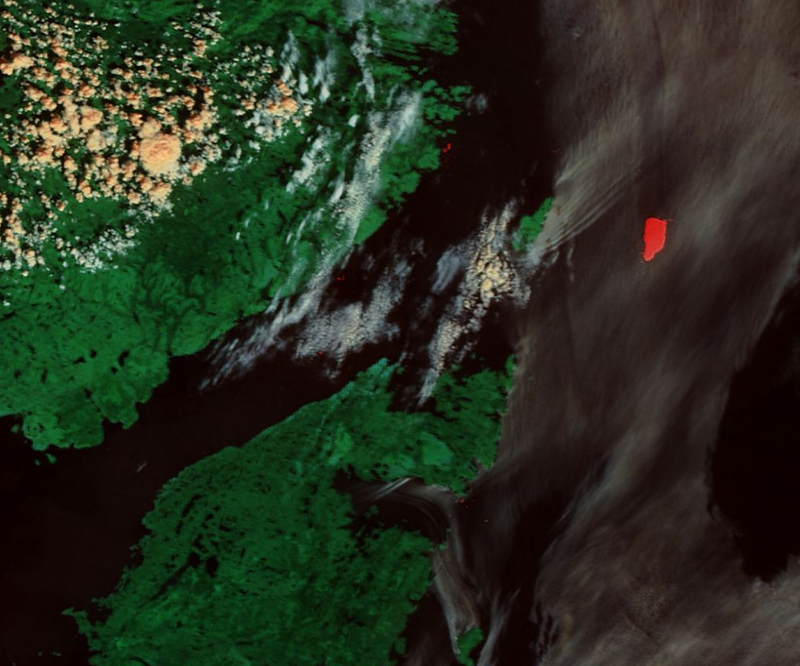 Usually used to identify features such as burn scars in vegetated areas, it also renders ice as bright red, distinguishing numerous false-red icebergs from yellow-white puffy cloud tops. 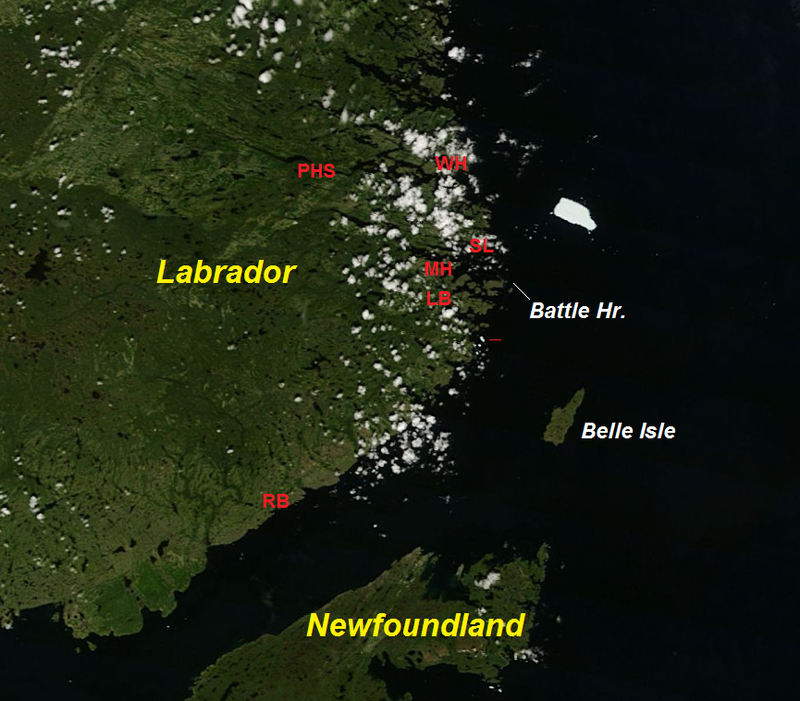 Not only is the main Petermann ice island conspicuous, the smaller ice islands and icebergs in the Strait of Belle Island and off the coasts of Labrador and Newfoundland pop out at you in the enlarged image. 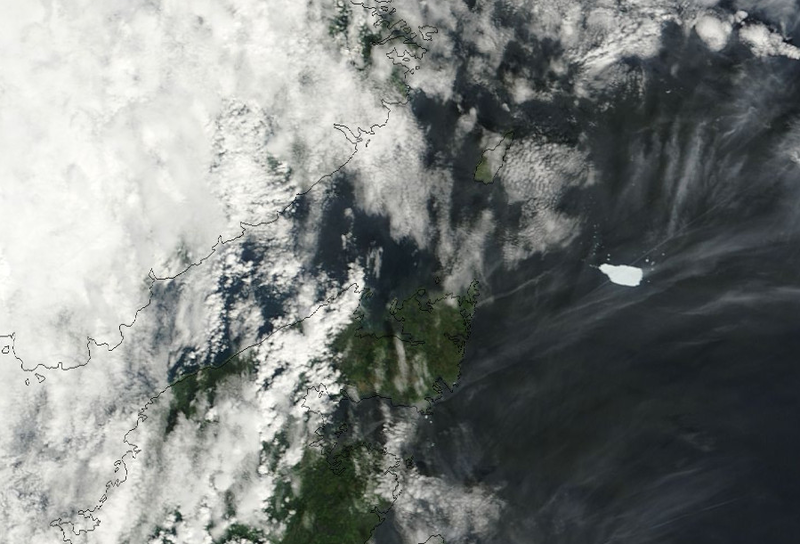 The latest Terra satellite image, taken earlier this afternoon, shows the main Petermann ice Island a tantalizing 16 km (10 miles) off the Labrador coast near Cape St. Lewis. It continues to drift southward at a rate of about 800 to 900 metres an hour, carried by the Labrador current. The size of the thing is now easily grasped by comparing it to Belle Isle, which lies due south. The nearby communities of Port Hope Simpson, William's Harbour, St. Lewis, Mary's Harbour, Lodge Bay, and Red Bay, are shown by their initials. ... the Petermann ice island is visible even on the low-res GOES-East weather satellite images! It is the white "speck" — remember, the thing is nearly the size of Manhattan — marked with the red crosshairs. At the time of this image (12:45 a.m. Atlantic), it was located about twelve miles off the coast near St. Lewis. CBC Labrador Morning did a phone interview from the community on Monday with Gary Bolger. St. Lewis may yet have the best terrestrial vantage point for viewing Petermann. Cheers: to elections and absolutely unrelated provincial funding announcements. The week’s total? Thirty press releases either announcing provincial government funding or announcing the announcement of funding last week, and that was by mid-afternoon on Friday. The announcements were made by a variety of touring cabinet ministers and MHAs. One of the announcements? Money for a Bay Bulls offshore site, and Business Minister Derrick Dalley says the timing of the announcement is mere happenstance: “This is not about an election. We’ve been working on this project for some time. My staff at the Department of Business, we have several applications before us, coming at different times of the year. We do due diligence, a very thorough process, as we work through these projects, and it just happens we’re at a stage where we got our work completed, and now’s a good time to get this out the door.” Good to know. Expect more completely-unrelated-to-the-election announcements in the upcoming weeks, spontaneously increasing as we approach the completely unrelated date of Oct. 11. One would hope that the completely-unrelated-to-the-election announcements will cease well before October 11 — that is, before the writ drops. This is the latest satellite image of the Petermann ice island off the southeast coast of Labrador, with some coastal communities and other localities also shown by way of reference. The main Petermann ice island is still about 55 square kilometres in area, and was about 20 kilometres off the coast at the time it posed for this portrait. It is roughly comparable in size to Belle Isle, or nearly as large as the island of Manhattan. 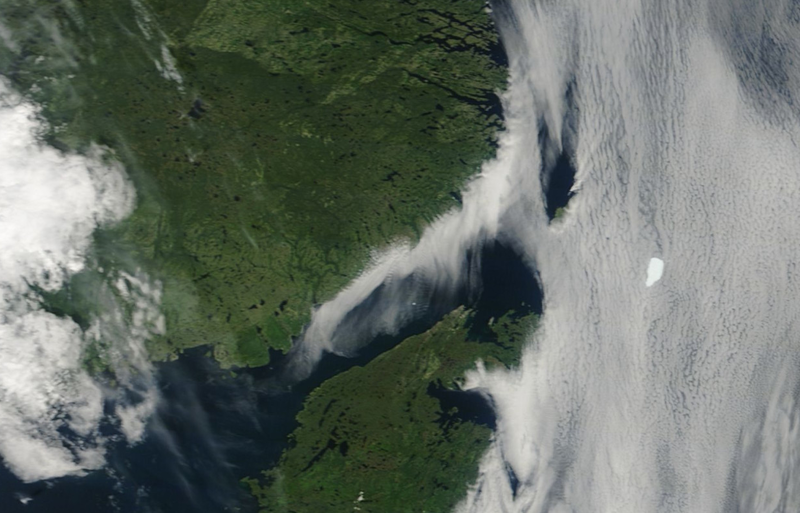 The last several days it has been drifting southward in the Labrador Current, closely paralleling the coastline, at about 15 to 17 kilometres per day. If it does not move back out to sea, ground, or break up, there may be viewing opportunities from St. Lewis, the most-seaward community on the Labrador road network, early next week. 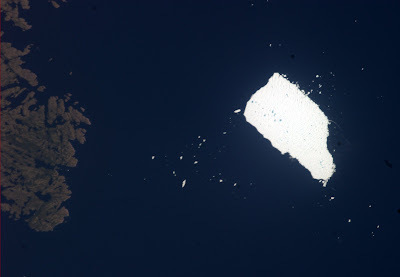 Smaller fragments of the Petermann glacier may be visible on this image near Camp Islands, at the northern entrance to the Strait of Belle Isle. "Smaller" is a relative term; they are still as large or larger as many seasonally-populated rock islands. Other scattered bergs, many of substantial size, are also visible in the Strait of Belle Isle and off the coast. Image: NASA/GSFC, Rapid Response, Terra satellite. 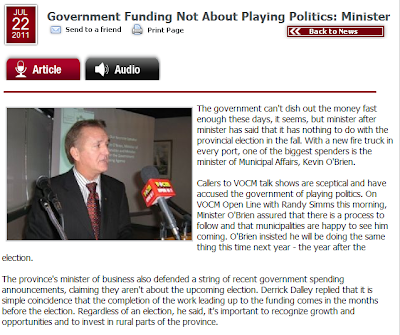 On VOCM Open Line with Randy Simms this morning, Minister O'Brien assured that there is a process to follow and that municipalities are happy to see him coming. O'Brien insisted he will be doing the same thing this time next year - the year after the election. "Buckingham to represent St. John's East"? To whom? In what? Back in the old days, only members, in their member's capacity, represented districts. If you have been nominated to run for a party in a district, you represent the party in the district — not the district itself. Northern communities, in a hydro-electricity producing and exporting region, still dependent on diesel generation and fuel oil. Nunavik plays an important role in Quebec’s plans to develop its hydroelectric potential: the rivers of Nunavik hold about 8,000 megawatts of electric power, 25 per cent of Quebec’s current output. But in Nunavik, oil remains king: diesel power plants in Nunavik’s 14 communities gobble up 25 million litres of oil for their basic needs and they use an additional 28 million litres of oil for their heating houses — and that doesn’t include the 40 million litres of fuel that Xstrata’s Raglan nickel mine consumes for its operations. The [Plan Nunavik] document points out that the economic development of any region requires transportation and communication links as well as an energy supply — but so far these have bypassed Nunavik, it says. Manufacturing, tourism, mining, have “all been made impossible because of the lack of accessibility and lack of a reliable, adequate power source, “ it states. "Truthfully," says the blogger, "Ottawa might be the best place to start the cutting rather than in a province that already has a lower than average share of federal presence." 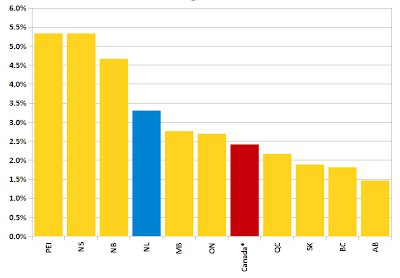 Truthfully, Newfoundland and Labrador has a higher than average share of "federal presence", behind only three provinces, and well above the national average. 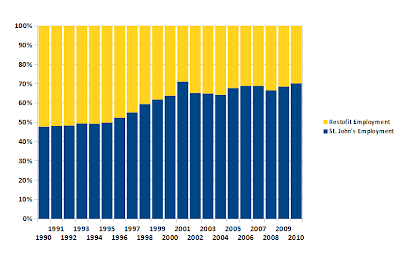 Data sources: Statistics Canada Tables 183-0002 (federal employment), 282-0001 (labour force). Data represents the average for the twelve months ending March 2011. *Population and employment data for the three territories, and data for federal employment outside Canada, are excluded from calculations. 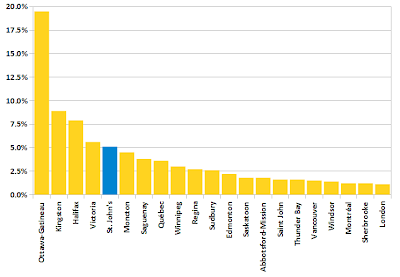 Herewith, a chart showing the federal civil service presence in major metropolitan areas across Canada, expressed as the total Full-Time Equivalent number of employees in September 2010, divided by the twelve-month average employed labour force in each metro area during that entire calendar year. Metro areas not shown on this chart have federal civil service presences of less than 1% of total employment. Date source: Statistics Canada Tables 183-0003 (federal employment), 282-0109 (employed labour-force population estimates for Census Metropolitan Areas). For some mysterious reason, St. John's municipal politicans and pundits at large are usually among those on the front guard of the "federal presence!" rallying cry. 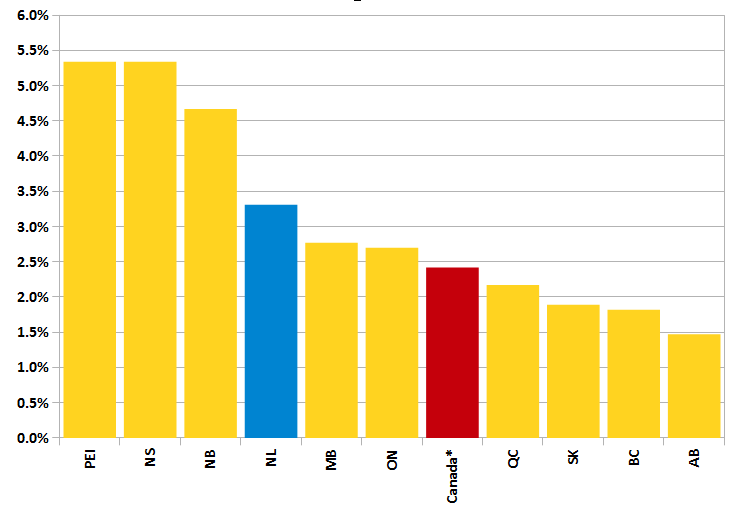 Never mind the fact that Newfoundland and Labrador has a higher share of the federal civil service than it does of the overall national population, or that the federal workforce in the province is the fourth-highest, adjusted for population, of any province. By gum, St. John's is peeved about the whole federal presence issue, and not shy about expressing it. But here's something for people in the rest of the province to bear in mind the next time a St. John's municipal politician jumps on the soapbox over this issue: St. John's is gaining federal jobs. In the early 1990s, the "federal presence" was heavily tilted towards non-metropolitan areas of the province. 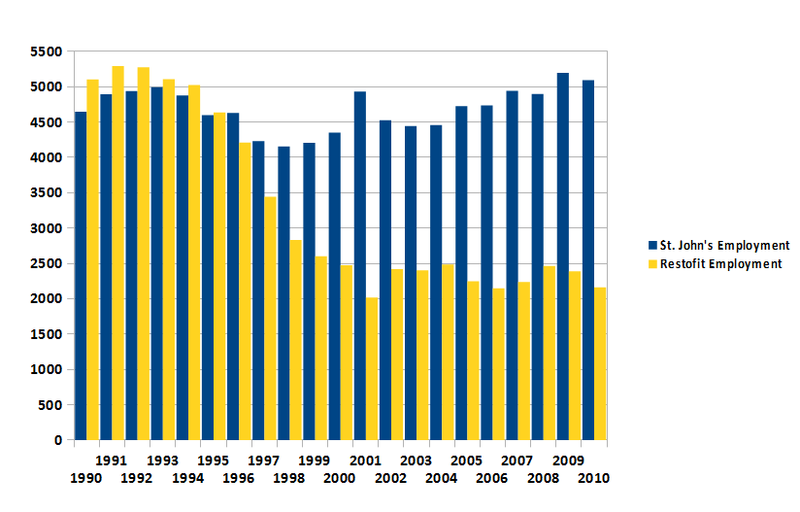 When program restraint, and the privatization of some previously direct civil-service operations, resulted in a reduction in federal employment totals in the first half of the 1990s, by far and away most of the jobs were cut (or transferred to the private sector) in places outside the northeast Avalon. 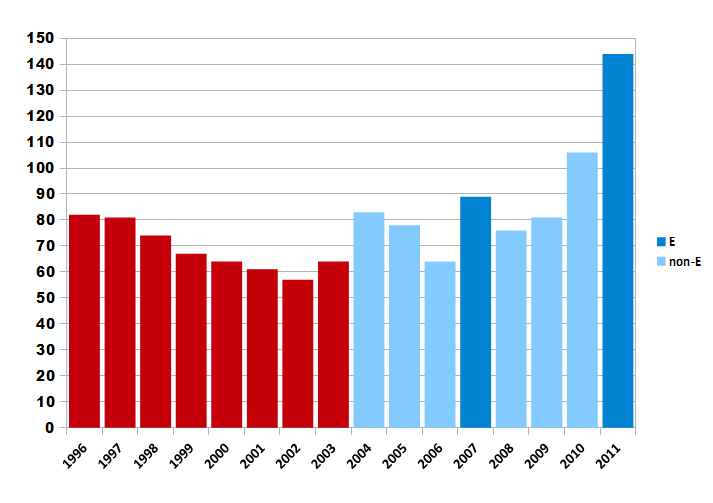 Since bottoming out in the mid-1990s, St. John's has seen a steady increase in "federal presence" of roughly 1000 FTEs, to the point where the federal workforce is now (in 2010) larger, in sheer numbers, than ever before on record. As a share of the total "federal presence" in the province, the St. John's metro area now has about 70% of total federal employment, as measured in full-time equivalents. The federal workforce in St. John's constitutes 2.6% of the metro population, 4.7% of the labour force, and 5.1% of employment. By any of these three measures, that makes St. John's the city the fifth-most dependent on federal government employment after Ottawa-Gatineau (obviously, 19.5% of employment), Kingston (8.9%, bolstered by RMC and federal prisons), Halifax (7.9%,bolstered by the navy and some regional offices), and Victoria (5.6%, also a navy town). 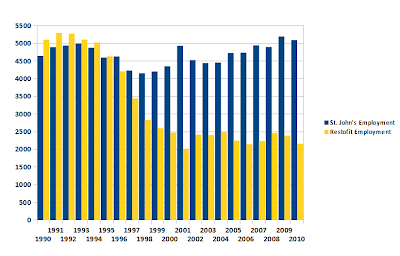 * Data sources: Statistics Canada Tables 183-0003 (for St. John's metro area) and Table 183-0002 (province as a whole). Table 183-0003 provides an annual count for each Census Metropolitan Area during the month of September. Table 183-0002 provides counts for every province for each month; the September data from this latter table is used here to provide an apples:apples comparison. Nalcor Energy will incorporate the transmission line into its integrated vegetation management program for its transmission and distribution system, which uses several methods including manual cutting as well as the selective use of herbicides for long term vegetation control. Certified crews will use herbicides in accordance with Nalcor Energy's current standard operating practices and applicable regulations. The management schedule will vary with the type of vegetation, the extent of ground disturbance during construction and terrain. Six people were seeking the nomination. A total of 1,616 people cast ballots in the nomination process. Surely they meant "A total of 1,616 Dunderdale2011 members cast ballots in the nomination process", didn't they? After all... isn't that what the Dunderdale2011 constitution demands? 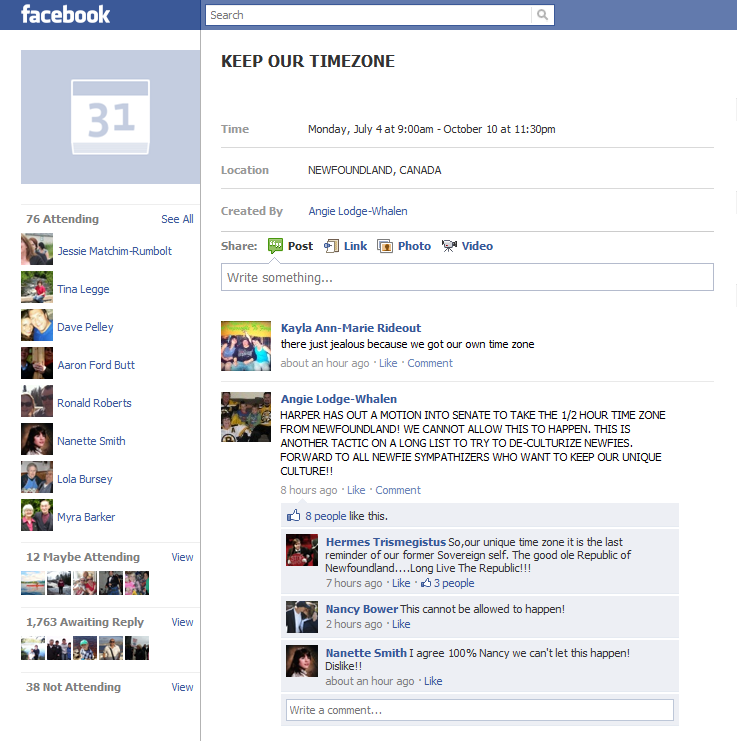 Shannon Tweed misses Newfoundland, appears in 'Republic of Doyle' episode: 14,871 page views, and counting. Better get used to Ice Caps: 8450 page views. Drowning in debt: 649 page views. It's July, that most wonderful time of the year... when Statistics Canada brings its free public data portal, CANSIM, up to date to June 2011. This means a body can update now-outdated charts which he produced just scant weeks ago for your colour-enhanced enjoyment. Once again, here is the stacked-bar portrayal of the provincial employed labour force, distinguishing three classes of working people: public-sector employees (which includes federal, provincial, and local government employees as well as crown corporation employees), private-sector employees, and the self-employed. As with previous charts of this type, the figure for any one month is actually the average of the previous twelve months inclusive. This smooths out seasonal variation which otherwise makes trends hard to spot. This is the picture with public-sector employees excluded. 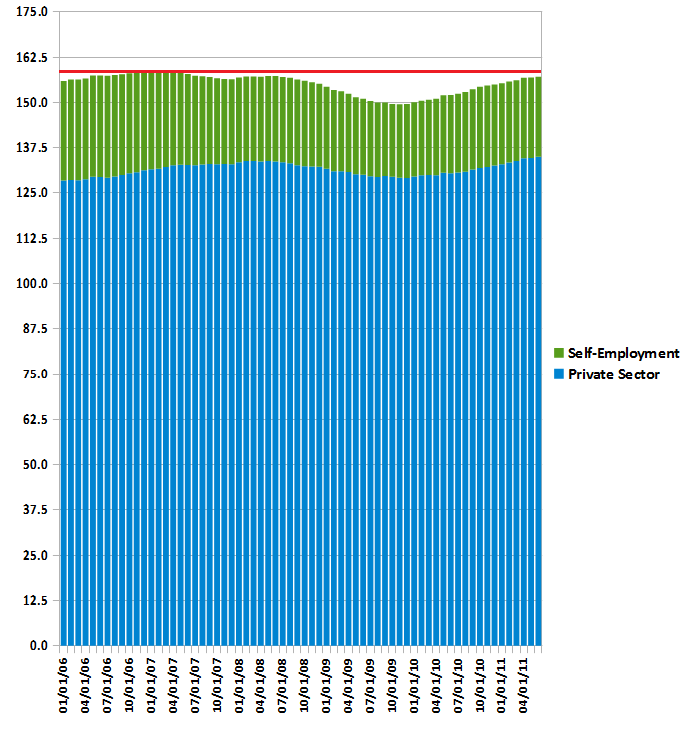 Only private-sector employees and the self-employed figures (again in thousands) are included. 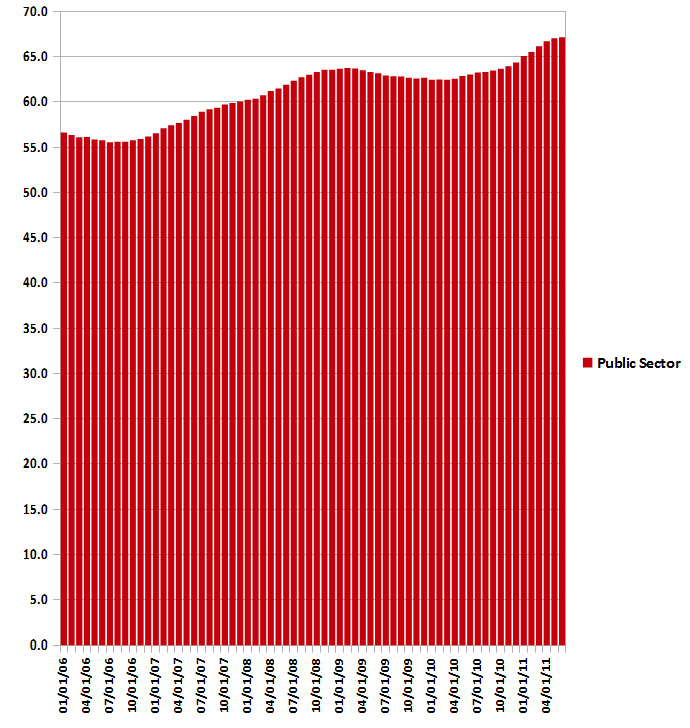 It is noteworthy, and not a little troubling, that the private-sector labour force has not yet recovered to the pre-recession plateau (shown as a red line). 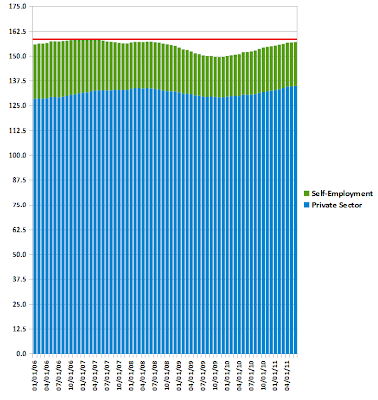 It is also a potential worrying sign that growth in the private-sector employment force, after about a year of respectable gains compared to the 2008 recession, has levelled off. 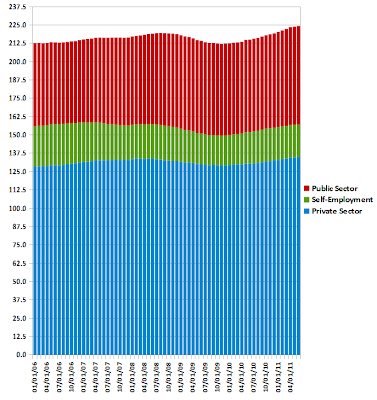 And here is the numerical growth in the public-sector employment force all by its lonesome. Again, this is the sum of all public-sector employees, including employees of all levels of government and all crown corporations. 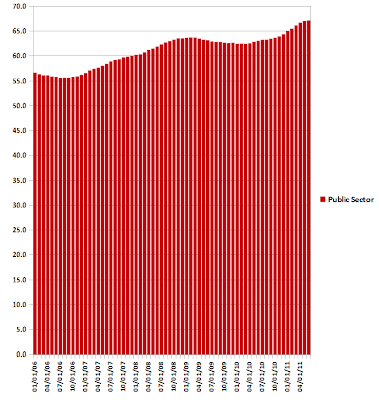 In the five years since the recent-historic low, in early 2006, of about 55,600 public-sector employees, the public-sector labour force has increased by about 11,500 or over 20%. 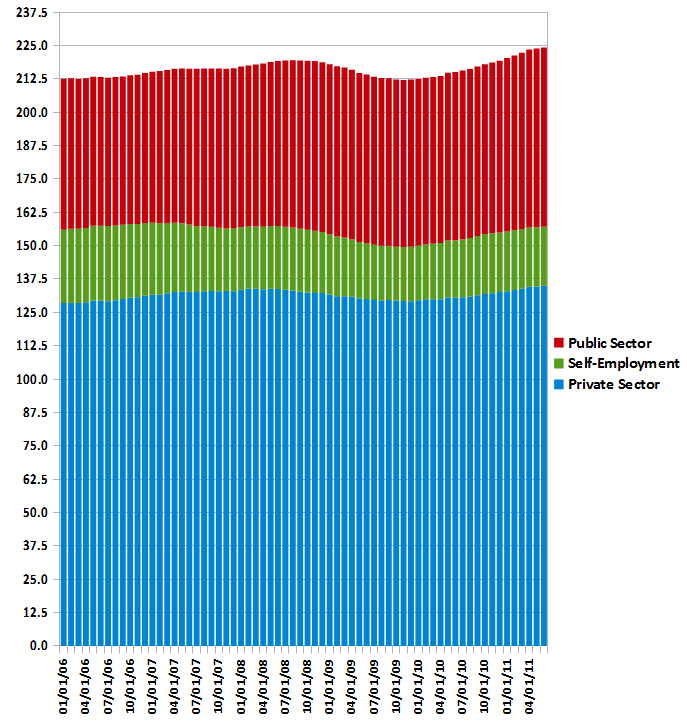 As a share of total employment, the public sector has grown from 26% to 30%. The twelve-month average ending in June 2011 was 67,100 — an increase of 4100, or 6.5%, from the same period twelve months earlier. 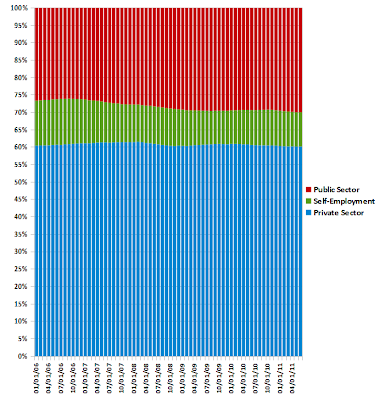 This represented an increase of over half a percentage point in the public sector's overall share of the employed labour force. “Our number one priority for developing Muskrat Falls is to meet the electricity demands of our own province and to stabilize rates over the long term. On that basis alone, if we never sold one megawatt of power outside of this province, development of Muskrat Falls makes sense and will bring significant employment and income to the residents and businesses of Newfoundland and Labrador,” said Premier Dunderdale. And who will be paying that income to the residents and business of Newfoundland and Labrador? Why, the residents and business of Newfoundland and Labrador will be! And they'll also be servicing Her Majesty's provincial government share of the debt incurred in this adventure in Albanian economics. Question of the day: Should we ask questions? This, today's Question of the Day from VOCM, is the most succinct statement of everything that has been wrong with politics and public discourse in Newfoundland and Labrador over the past decade. It would be unbelievable, if it weren't so... believable. Nova Scotia Power and the provincial government are expecting that the feed-in tariffs will bring in wind, biomass, small hydro and tidal projects that can deliver up to 100 megawatts of power per year — the bulk of that from wind farms producing at 13.9 cents per kilowatt hour. What’s interesting in the equation in this province is that, even though the provincial government says it’s concerned that increased demand for power will drive up the cost of running the Holyrood generating station, and therefore prices to consumers, it hasn’t moved to set feed-in tariffs in this province. In Nova Scotia, the tariffs are set for 20 years, allowing potential electricity producers to plan their potential return on investment and costs. Setting tariffs here would bring new generation sources online, potentially forestalling the increases without taking on massive new amounts of provincial debt. The provincial government, in its 2007 energy plan, suggested that alternate power on the island could produce an extra 100 megawatts of power from wind and small hydro power generation — but instead of feed-in tariffs, it’s pretty clear the province prefers controlling any development through its energy corporation, Nalcor. It looks a lot like the province would prefer all its eggs in one basket. Or, more to the point, the province not only wants to run an energy warehouse, but actually wants to own it all as well. In its own way, that handcuffs consumers in this province. Because one company will decide the most effective way to produce and supply our power. We’ll just pay for it. • Barriers which it would be valuable to overcome (locally or internationally), but where the required innovation is not technological. These barriers may include policy, regulatory, market, taxation and other challenges. This finding applied to all energy types, and in the case of energy efficiency, it was found that the barriers were exclusively of this type. The fear that someone might actually want to have this adult conversation about energy policy, and its potential implications for the Danny Williams Memorial White Elephant, are likely the proximate cause for two strange features in the chronology. First, the report which Shawn Skinner released and buried on the same day, July 7, 2011, bears the date of August, 2010. Yip. They've been sitting on Favourite Economist's report for almost a year. Second, "Phase Two" of the Stifling Innovation Roadmap won't be released until 2012. That is, like the final agreement (if there is one) with Emera on the Danny Williams Memorial White Elephant, and the environmental assessment of the Labrador-Newfoundland outstarve line, after the October 11, 2011 provincial election. About a decade ago, a map of the draft Labrador Inuit Land Claims and Self-Government Agreement was in circulation, under the title "The Changing Face of Labrador". The middle part shows the categories of land status proposed in the draft Labrador Innu settlement. 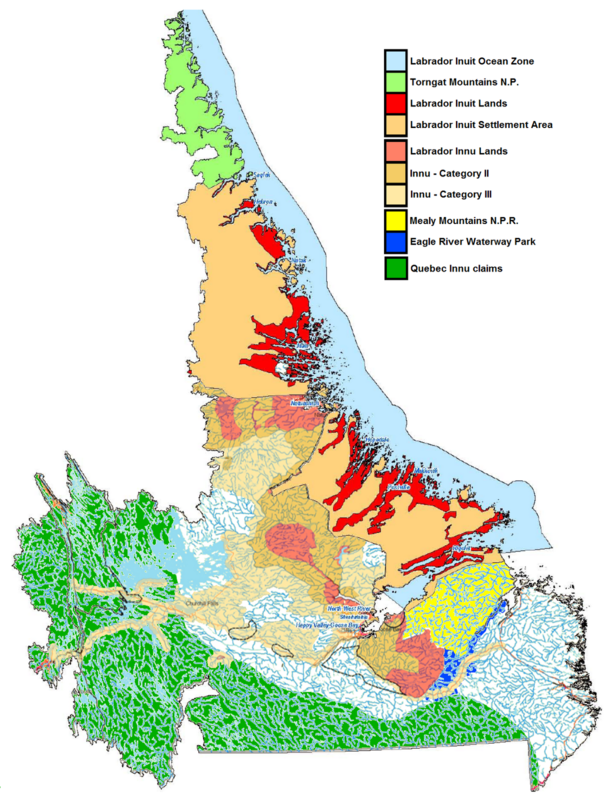 (N.B., a few area of Innu lands on this map are unavoidably sorted behind the Labrador Inuit layer of the map, especially in the area around the head of Double Mer.) Also shown, but not indicated in the legend, are the "Economic Development Areas" as proposed in the draft agreement. 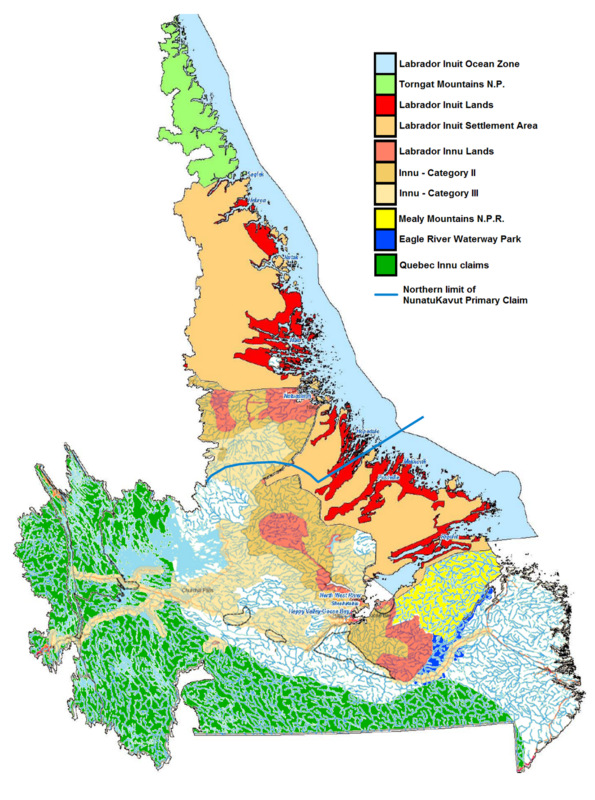 To the south, in yellow and dark blue respectively, are the proposed Mealy Mountains National Park Reserve and the proposed provincial Eagle River Waterway Park, whatever one of those is. 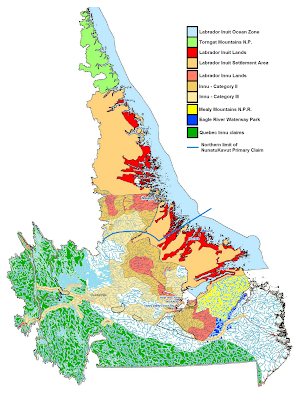 Again, the sorting of the map layers superimposes a small portion of Labrador Inuit and Innu land classes over a portion of the proposed parks. The dark green in western and southern interior Labrador are (approximately) areas which are subject to land claims by the various representative bodies of Innu in Quebec. These claims have not been accepted for negotiation by the provincial government. UPDATED: The blue line which cuts across north-central Labrador from the Border Beacon area (the "big bend" in the northwestern Quebec-Labrador boundary) to the coast just south of Hopedale, is the northern limit of the Primary Claim area asserted by NunatuKavut (formerly the Labrador Métis Nation.) All of coastal and interior Labrador south of this line is included in the claim which they have filed, but which has not yet been accepted for negotiation. Not directly shown is the overlap area of Nunavik Inuit rights in northern Labrador, which on land corresponds to the Torngat Mountains National Park. There is also a Nunavik offshore Labrador zone, not shown. Also not shown is the NunatuKavut (Labrador Métis) land claim; a recent and accurate map of that claim would be gladly received and this map updated accordingly. So yesterday, Shawn Skinner released something which his press release grandiloquently calls "Phase One Report on Energy Innovation Roadmap". Don't bother looking for it under that name at the link provided, though. It is cleverly disguised under the more prosaic heading of "General Reports", with the even more prosaic title Innovation Priorities Report. There's a lot to digest in there. This would seem worthy of further discussion — maybe in Phase 26, component 43 of the "Energy Innovation Roadmap", whatever that is. What policy and regulatory barriers does the province throw in the way of energy industry innovation? Darn good question, innit? Someone should ask it. But in the absence of any serious discussion of such matters in this heavy 41-page tome, let's instead turn to perhaps the most interesting passage of all. The date. Right on the cover: "Final Report, August 2010". Why, oh why, might The Most Open And Accountable Government In The Solar System have been sitting on this Very Important Report for almost a year? With the traditional Fire Truck Month now re-scheduled and stretched out over the entire Fire Truck Season which, coincidentally, precedes election season, it is entirely appropriate, then, that the apparatus of Williams Dunderdale2011 Government be turned entirely to putting out political fires. Liberal Education critic Marshall Dean says students who are hoping to obtain funding to attend post-secondary institutions in the fall are being told their applications can't be processed before the deadline. Dean says some students only received their acceptance letters since Canada Post employees returned to work after their postal strike. Now, with a July 8th deadline, students are being told their applications cannot be processed. Dean says the processing of applications falls under the Department of Human Resources, Labour and Employment, and he wants the minister to act. He says he wrote Minister Darin King last week, but he hasn't received a response. There's a reprieve today for post secondary students who are going to miss the deadline to apply for government funding because of the disruption in mail service. The original deadline of July 8th was too tight this year because of the postal dispute. However, on VOCM Open Line with Randy Simms this morning, Labour Minister Darin King said the deadline has been extended to the end of the month. King says the government doesn't want to see anyone miss out because of the postal dispute. Long-standing decades-old pollution problem in Hopedale? 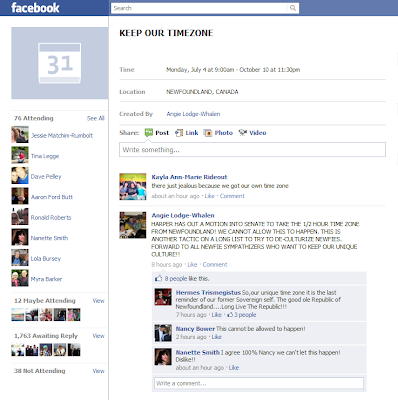 There's a meeting to deal with that, plus an announceable on another northern Labrador environmental nuisance. The Burin Peninsula needs a little love? Then a couple of doses of love it shall get, and that, on top of the ferry-related carrot now being dangled in front of all the shipyard towns and ferry-dependent communities. Want internet? They have the internet for computers now. What better time than the pre-election present to throw some money at the mooses? And can you ever have too much dollar-sign-heavy boilerplate? Budget 2011 Standing Strong: For Prosperity. For Our Future. For Newfoundland and Labrador provides funding of $216.4 million for road and bridge improvements, supplemented by an additional $35.2 million in Federal Government funding, for a total road and bridge investment in 2011-12 of $251.6 million. Not even when the wharf-related press release it's attached to renders the "road and brige" boilerplate nonsensical? Now that the suspense is removed by fixed-election dates — oh, sorry, fixed election-dates — you just have to wonder... couldn't some of these long-term fires have been put out before now? Port Hope Simpson resident Eldred Burden's amazing video of one of the little Petermann ice islands off Labrador has now been featured in media outlets and websites as varied as CBS News, Phil Plait's Bad Astronomy, and, implausibly but amazingly, Ekspress in Estonia. The latter hit has generated nearly a quarter of the video views to date. It will be another few days before the premier is back on home soil. Kathy Dunderdale was in France on the weekend for memorial ceremonies. After some work in London, U.K., she will be heading to Nova Scotia for the Conference of the New England Governors and Eastern Canadian Premiers this week. Oh, it's a long weekend? Where you will find the RCMP's press release concerning the report on the Leo Crockwell Bay Bulls incident: as a scanned, non-textual PDF put up as a public service by the CBC. Where you won't find the RCMP's press release concerning the report on Leo Crockwell Bay Bulls incident: on the B Div's newsroom website.